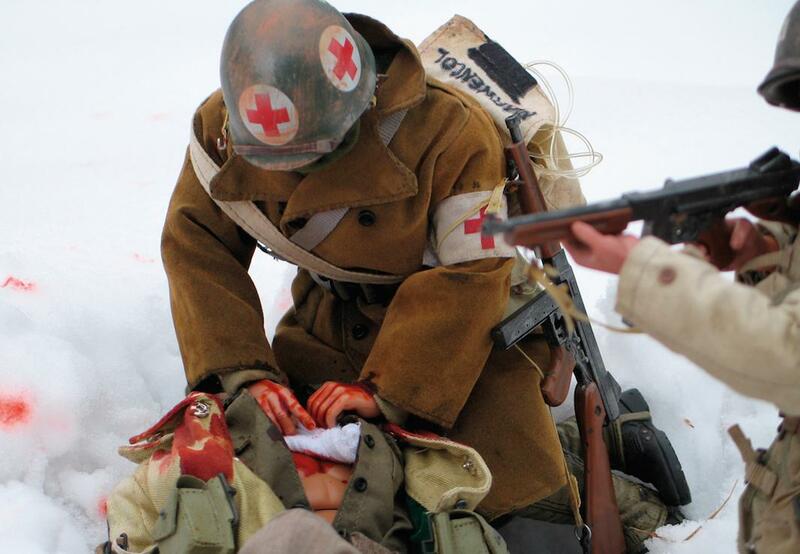 If Mark Hogancamp hadn’t almost died, he probably never would have found Marwencol. In 2000, after five years in the U.S. Navy, he was attending Alcoholics Anonymous meetings and struggling to find his way working odd jobs in Kingston, New York. One night at a bar, he met five men, and after they found out that he liked to cross-dress, they beat him into a coma that lasted nine days. By the time he left the hospital more than a month later, his dependence on alcohol was gone—but so were his memories of his former life. Mark’s alter ego, Hogie, is nearly beaten to death by five SS soldiers. As he learned to read, write, and eat again, he also rediscovered his love of World War II and miniatures. 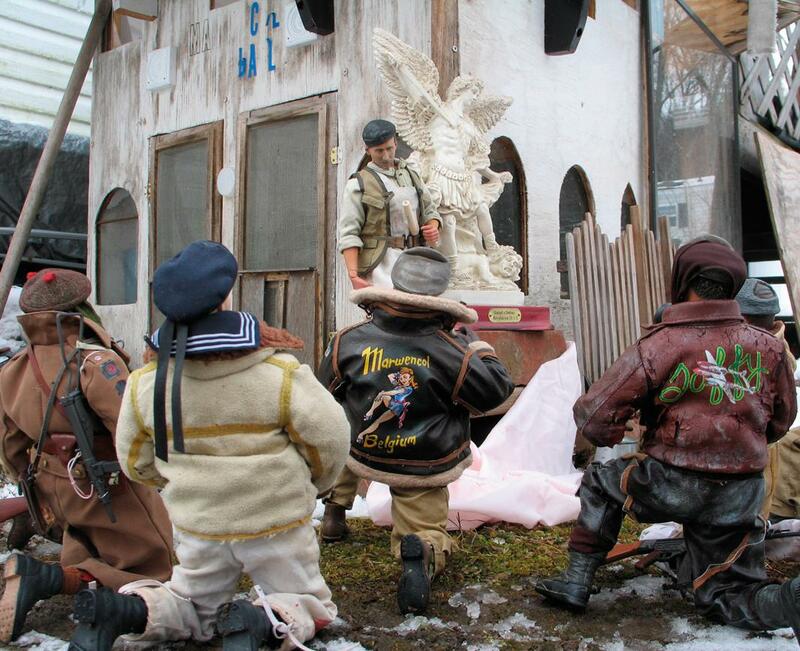 He bought 1:6 scale figures that resembled him and his friends and started building an imaginary war-era Belgian village for them outside his trailer in Kingston’s rural outskirts. 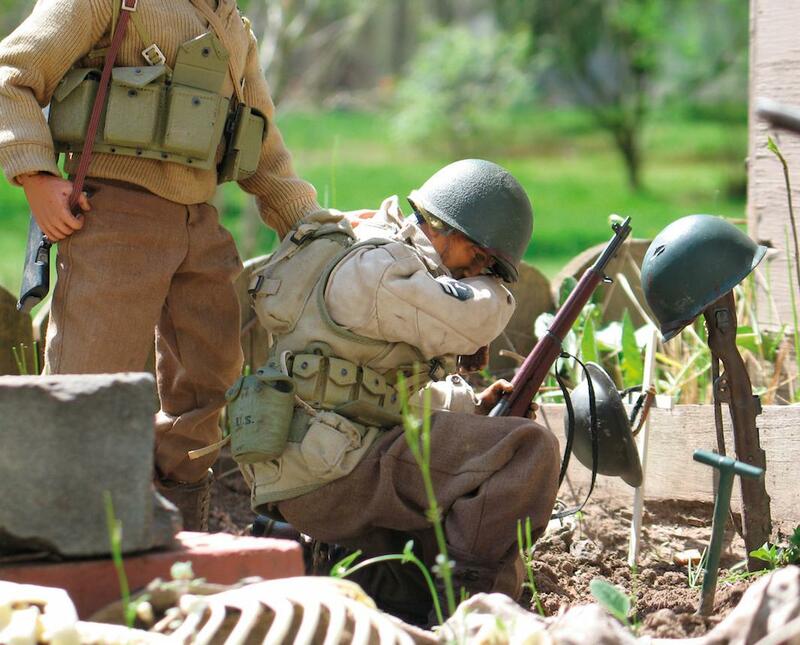 He called it Marwencol, a portmanteau of his name and the names of new friends Wendy and Colleen. His newfound hobby, he found, was therapeutic. 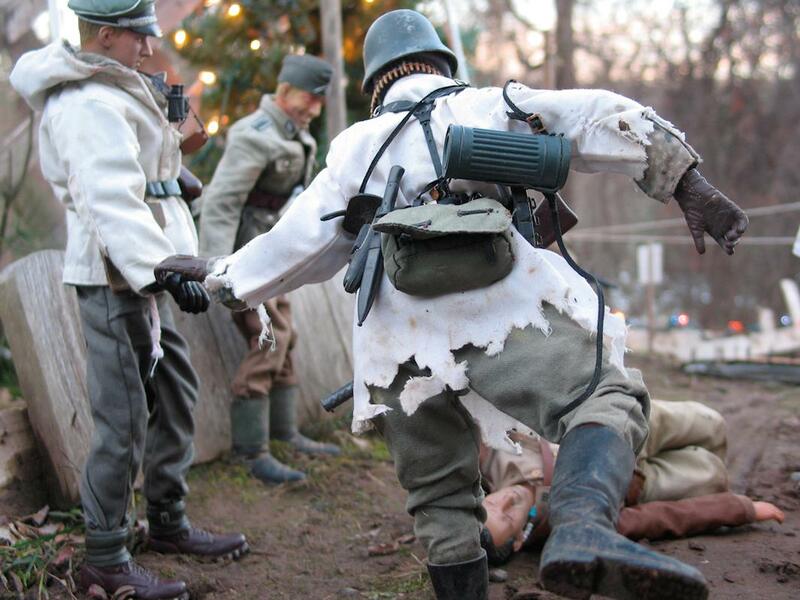 Welcome to Marwencol, which Princeton Architectural Press published last month, tells Hogancamp’s story. With text from Chris Shellen, it is illustrated with photos Hogancamp has taken over the years, which he used to convey to friends and family the lives and storylines he imagined for his characters. “Getting my imagination running on all eight cylinders was my passion at the time, and the town I was building and the world that I was creating for myself were the only things that mattered to me. I just needed a way to document my imagination coming back to life inside of my immensely damaged brain,” Hogancamp said via email. Lt. Tonjes at the public unveiling of his statue, Satan’s Defeat. Medi-Jeep tries to save one of the Rangers who was hit by a sniper on New Year’s Day. Those photos found much larger audiences after Jeff Malmberg made an award-winning documentary, Marwencol, about Hogancamp, and he was featured in an episode of This American Life. His work is now represented by One Mile Gallery, and he has fans around the world. Hogancamp was brand new to photography when he first started taking snaps of his tiny Belgian village with an old 35 mm Pentax film camera. A few years later, he started working with a Canon G6 digital camera, and his images improved drastically. 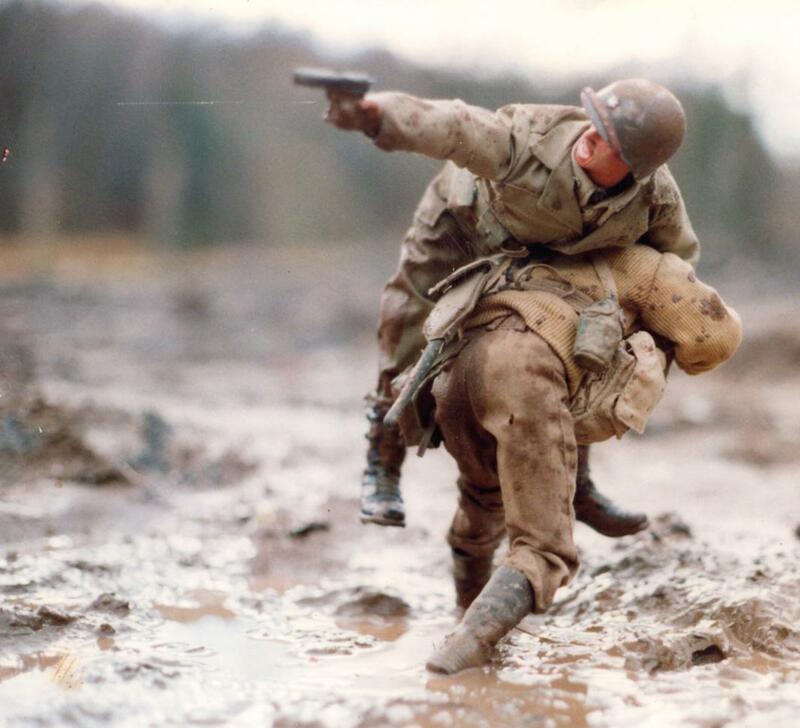 This summer, a man used Hogancamp’s photo, Rescuing the Major, as an example of “real American courage” in a viral Facebook post criticizing Caitlyn Jenner’s public debut, not knowing the soldiers in it were toys. More than 15 years since the attack, Hogancamp is still recovering. and Marwencol continues to be a crucial ingredient, one he doesn’t believe he’ll be abandoning any time soon. Rescuing the Major—the 2004 photo that won the Ultimate Soldier contest. Left: Deja Thoris. 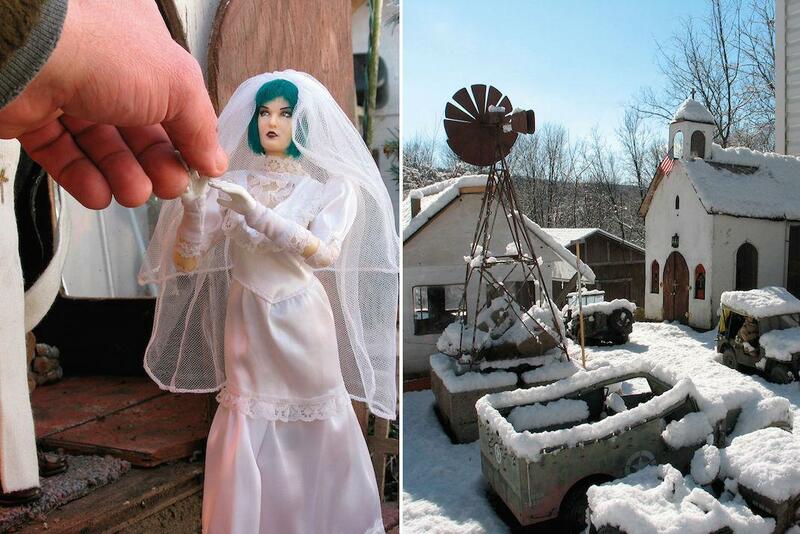 Right: The Church of Marwencol in the snow.